MVP’s new UltraBond unit is the ultimate solution for your methacrylate adhesive material processing needs. Now you can count on simple, accurate metering and mixing (no gear pumps) with this rugged, easy-to-maintain unit. 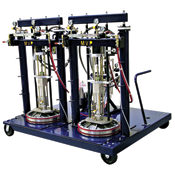 You get double-acting piston pumps for smooth, continuous power, stainless steel transfer pumps, proportioner pumps, hoses, gun & fluid sections with air/solvent flushing. Featuring the MVP Powerslide power head, the UltraBond delivers a rugged 15:1 power ratio from the 7″ power head; the only true low psi power head on the market. Interchangeable parts for alternate ratios are also available. Operators will benefit from quick response shifting and a pilot valve operated by line pressure for reliability and ease of use. Modular Rapid Access Design (RAD) means fewer parts for easy maintenance and low maintenance costs. It all happens at the gun: The UltraBond 1:1 dispensing gun is the #1 choice of methacrylate adhesive bonding users. The gun incorporates an easy ratio check feature that assures proper mix every time. In addition, the UltraBond gun also features a “night cap” for protection against accidental crossover. Call today and benefit from the UltraBond gun’s rugged stainless steel, straight-through material flow & 3/4″ stainless steel mixer with disposable inserts.